At Vannity Salon you’ll find timeless elegance meeting today’s hottest trends. Styling hair and giving you confidence is our calling. Creating new looks is our art. At Vannity Salon, beauty is taken seriously in a relaxed atmosphere for you to enjoy. We aren’t just stylists. We are beauty operators. And this isn’t just a salon. It’s a Vannity experience. Color Variation: personalizing each hair color service by utilizing advanced skills for creating various types of blondes and brunettes. This is done by adding layers of tones, depth, and brightness where needed. Blonding: using the highest performing haircare products and latest techniques from around the globe to create the most natural to bold variations of lighter hair. - Consultations are always complimentary and suggested for any client who needs help determining services that best fit their needs. - Variations in pricing reflect the level of each stylist's expertise in regards to the services being performed. - Hair types that require extra time due to length and density will result in an up charge for the additional time and product needed to complete the service. - Color services are guaranteed when color-safe hair care products are used for maintenance. Combine Vannity's beautiful relaxed environment with the most phenomenal nail services in town. Dawn West's work is meticulously thorough, creating long-lasting beautiful services of the highest distinction. Express services are offered to returning clients who have a nail care regimen in place. Please call for these services. We aren’t just stylists. We are beauty operators. 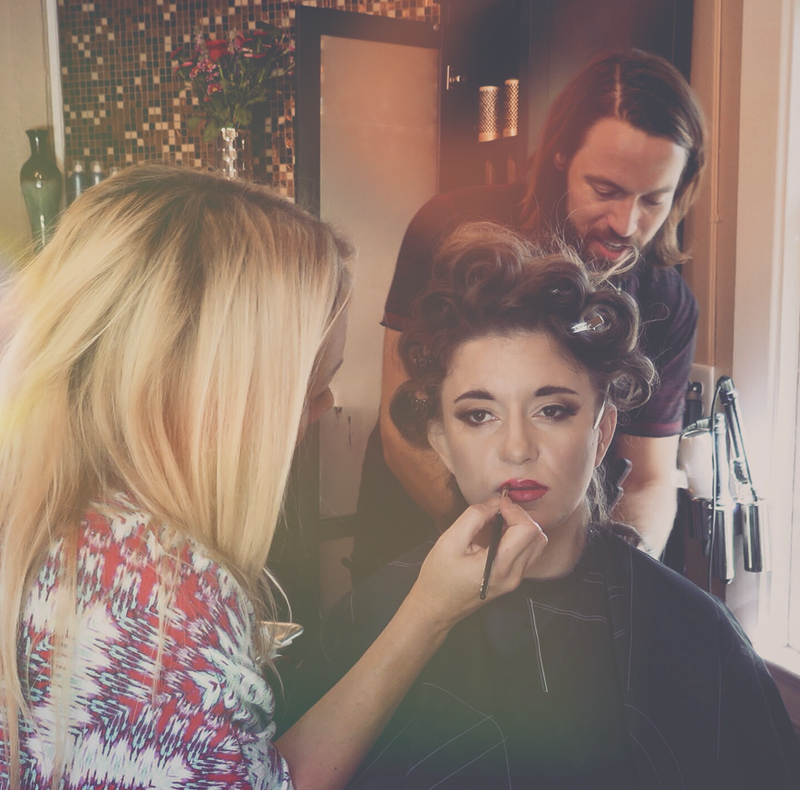 Vannity Salon's owner, Travis Vann, is an accomplished stylist who ensures excellence with every salon experience. Travis is an expert colorist who worked with the prestigious Italian company, Framesi, for nearly 15 years. Travis’s meticulous eye and exceptional skill earned him a coveted spot on Framesi's Italian Style Team in 2010. Travis has also been a Framesi Design Group Member. As a Design Group Member (one of eight in North America), Travis traveled across the US to instruct other stylists on the latest in cut and color techniques straight out of Milan. Travis believes in constant learning, and is continually seeking out great education. He has advanced his training by participating in elite Vidal Sassoon Academy Classic and Creative Courses in Miami FL, and Graham Webb Academy in Washington DC. Travis's training does not end with the US borders; he travels internationally to seek out the latest inspirations and techniques in the beauty industry. Travis enjoys treating his clients to the best salon experience possible, while using his expertise to find a look that they will love and that others will be envious of. Alexa Dorsey is a gifted stylist who has worked in the beauty industry since 2001. Alexa creates looks ranging from elegant to edgy, with stunning finishing work. Alexa's exceptional talent and style, as well as her dynamic energy inspire us all. Amanda Pokrzywa is an accomplished stylist and has worked behind the chair since 2002. She was a certified Framesi Haircolor Educator from 2007 to 2012, instructing stylists nationwide on cutting-edge techniques and styles, and has attended the Bumble and Bumble Academy in New York. Amanda seeks continuous learning worldwide on the latest trends and updates in the industry. From London to Prague, Amanda has gained extensive training including NYC for Liscio Thermal Straightening, Coppola Keratin Treatment Certification, and has attended the International Hair Show in England. Amanda strives to create an outstanding salon experience to help all her clients feel beautiful, inside and out. Dane specializes in Framesi’s Italian hair coloring and cutting techniques. His dedication to perfecting his work led to an extensive apprenticeship under Master Stylist Travis Vann.Continuing education has always been Dane’s primary focus to ensure that he delivers the most up-to-date trends and styles to his referral based clientele. Dane worked as a personal stylist for over four years at Nordstrom. There he realized his passion for hair design. With an artistic eye and critical attention to detail, Dane designs each service to compliment his client’s unique style. His sweet and charming personality will have you relaxed and having fun like old friends in no time. Joy began her career in 1999 as the assistant to a senior stylist at one of Wilmington's premiere salons. After graduating from UNCW with her bachelor's degree in business management, Joy quickly realized she didn't quite feel at home in the corporate world and decided to explore her interest in the beauty industry by enrolling in the cosmetology program at a local Community College. It wasn't long before Joy knew this was her destined path. After years of experience, Joy has acquired a diverse and loyal clientele. She has also had the privilege of training under some of the world's foremost beauty industry artists. By attending trade shows and educational events, Joy continues to further her knowledge and hone her craft behind the chair. While Joy provides a wide variety of services, her true passion is combining cut and color to create a customized look unique to each of her guests. However hair isn't Joy's only love. Some of her favorite things include coffee, scarves, cardigans, birds, organic foods, chocolate chip cookies and hearts! Nichole loves all things beautiful and unique. Her philosophy is, "a woman's beauty lives in her individuality." Nichole's love of hair and fashion started with paper dolls and has evolved into an amazing career. Over the years she has traveled to NYC to study at Bumble and Bumble University and worked with some amazing stars in the industry. Her work has been featured in Salon Today magazine, Oribe.com, Bravo TV, Mercedes Benz Fashion Week, and Good Morning America. As a hairstylist she is challenged every day and never stops learning. She approaches each service with understanding first, which helps to build the framework for an enduring relationship. Passionate about the healing nature of her work and devoted to delighting her clients, Dawn West is a nail care specialist with more than fifteen years experience. Dawn focuses on natural nail care, providing professional services that nurture the nails, hands, and feet, while providing personal attention and a spa experience that nurture the soul. You'll find no assembly line nail service here and you'll never feel rushed as this nail perfectionist pampers your fingers and toes. Dawn's professionalism is evident in her commitment to continuing education, safety, sanitation, and nail health. Her warmth and sincerity are among the many reasons that Triangle women and men are loyal to this Raleigh native for all of their nail care needs. Whether the client is a first time visitor preparing for a special occasion or job interview or a client of fifteen years coming in for routine care, everyone who leaves Dawn's chair will feel pampered and beautiful! Suzie's professional background has evolved from a history of event planning, market management, advertising, bartending, and restaurant management. It's almost as if everything she's done up to now has been to prepare her for the salon industry. Since 2011, Suzie is continuously inspired by her co-workers, and thrives off the challenges of growing a local business. Her priorities at Vannity Salon are to support and promote our incredible team of talent, and to provide unparalleled customer service to clients. Please call the salon directly to book your reservation today. We also offer online scheduling through Booker as well as through Facebook. Please give us at least 24 hours notice when cancelling an appointment. Less than 24 hours notice will result in a missed appointment fee. Treat someone you love to the Vannity Salon Experience with a gift certificate.